Happy Monday and Happy June! Here's to another month full of sunshine, inspiration and hopefully, some creating too. Last week I had the pleasure of spending some time in Spain and while I was there, I had a little time in Barcelona. 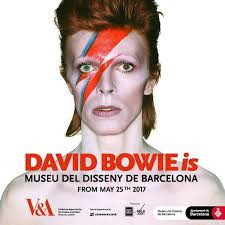 Now I promise you that the trip to Barcelona was planned and booked first but imagine my overwhelming joy when I heard that a certain exhibition about a certain musical hero of mine that I'm still obsessing about was going to open on the day we arrived. Of course, I had to go online on the first morning of ticket sales to secure a ticket for myself for the first opportunity I could get there - early on the very next morning! As you can imagine, it was fabulous and I'm still overcome with joy and sadness and hero worshipness - again. So this week, I'd like you to be inspired by the poster for the exhibition. The poster features just one of the many iconic images of this incredible man as his alter ego Aladin Sane, by Bowie photographer Duffy. There are several ways you could take this inspiration and maybe I need to make a layout for each one! There's the lightening flash which could be incorporated into your design, or maybe just the colours. There's the layout design or the font - several to choose from. The exhibition originated from the V&A Museum in London and the current one is is Barcelona so a travel layout could make an appearance. The music direction is an obvious one as is the subject of the great man himself. Or perhaps, you'd like to take the "David Bowie is... " idea and adapt it to a subject of your own. The exhibition is a retrospective which gives a further option. See, I told you there were several! Whichever way you see the inspiration this week, I'd love you to share and as always you can either upload your layout into the Whimsical Musings Flickr gallery with the tag WM#260 or you can post it in our Whimsical Musings Facebook group. We've decided that we'll save albums for special occasions so just load up your photo to the group with the tag WM#260 in the write up text so that we can find it.